First things first, this is so easy to make and it's incredibly flavorful. This meal is definitely nodding towards spring, which is usually when we have this on our weeknight rotation. We're so close! The weather here can't seem to make up its mind, as we've gone from snow storms to 56° all in the span of 48 hours. It seemed about time to share it, as we gear up for lighter spring fare. 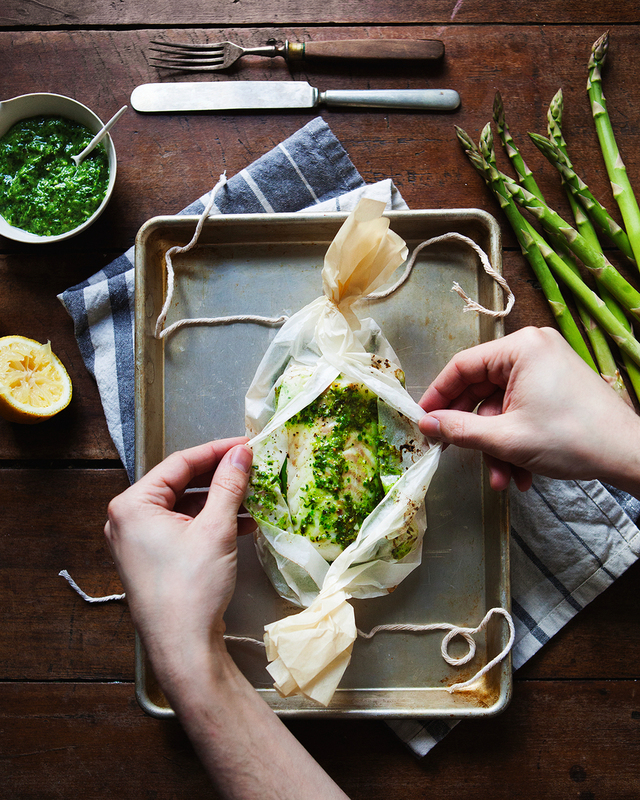 Fish in parchment has, as I said been a steadfast weeknight meal for us, even before I started the Whole30. Speaking of which, having a husband who cooks like Robert has made Whole30 incredibly smooth sailing for me. This method cooks the fish and vegetables perfectly, leaving the asparagus with a little bit of crunch to balance out the flaky cod. It's perfect if you're avoiding grains and want something bright tasting, but filling that's not incredibly time consuming. Set two pieces of parchment paper on a baking sheet. Place potato slices, lemon slices, and asparagus in the center of each parchment sheet. Top with cod, season with salt and pepper and top each with 1 tbs pistou. Close parchment tightly and wrap each end with twine to form a sealed packet. Bake for 20 minutes, remove from heat and let sit 2 minutes. Carefully open packets and top with additional pistou to serve. In a food processor, pulse to combine scallion, garlic, and juice from lemon. When a coarse paste has formed, scrape down sides, run food processor and slowly drizzle in olive oil.